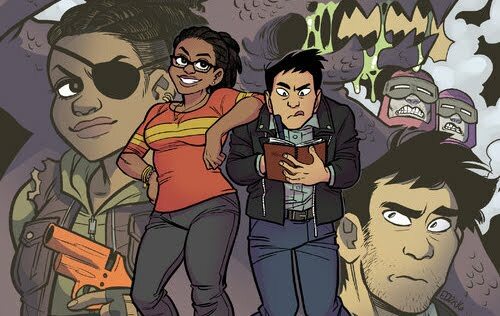 This is my first review for Oni Press and boy is it a doozie! First up, the first volume (of) two drops this week, collecting the first five issues of last year’s comic that I wished I knew about sooner - this hands down would’ve been my favorite comic of 2018 if I’d read it sooner. The Long Con is a simple premise with astronomically detailed worldbuilding. That is exactly what I look for in a comic. We get to see up close just how society inside of a post-apocalyptic comic-con. We don’t just see your usual canned foods and medical supplies. Con badges are hot commodities and they’re checked at each doorway like a security checkpoint. Each fandom has formed a territorial gang where knowledge of 70s TV trivia could mean life or death. And of course, we have the convention center itself. I’ve been in a lot of them and they’re all built to withstand an atomic blast. There’s brilliant writing here as we get a look at the comics industry and the pop culture fandoms and how close they both are to literal warfare. Some of the scenes here aren’t fantasy and personally I’ve experienced many similar encounters at cons over the years - apocalypse not included. Not only is there great worldbuilding within the post-apocalyptic convention center, but we also see some great parodies and homages to real-life pop culture. The fictional worlds explored all feel very alive as if the creators are putting in the work two create two separate stories here. The attention to detail is master-level here. Just as I was finishing up this first volume I was actually getting a bit depressed that this was only a limited series. I wanted more. Luckily this series that I’ve only just heard about is already back with a new issue. This week’s new issue explores the inner workings of Long Con’s political state. Cape Town - the convention hall where the big superhero publishers were set up - is ruled by the Helvetica Caslon, Editor-in-Chief of the biggest comics publisher and she is ready for war. We get a beautiful full-page map of the convention center and learn about how it was laid out both before and after the apocalypse. But more interestingly, we see Helvetica’s early days as a TV writer working on Skylarks, the Star Trek type show at the center of one of Long Con’s biggest fandom factions. Helvetica seemed to be introduced as a one-off character, but this issue seemed to solidify that she’ll be holding a larger role in the second half of this series. What is her relationship with the mysterious “Special Guest” that the entire con worships like a deity? And most importantly: exactly what was the cataclysm that resulted in the longest con of all time? 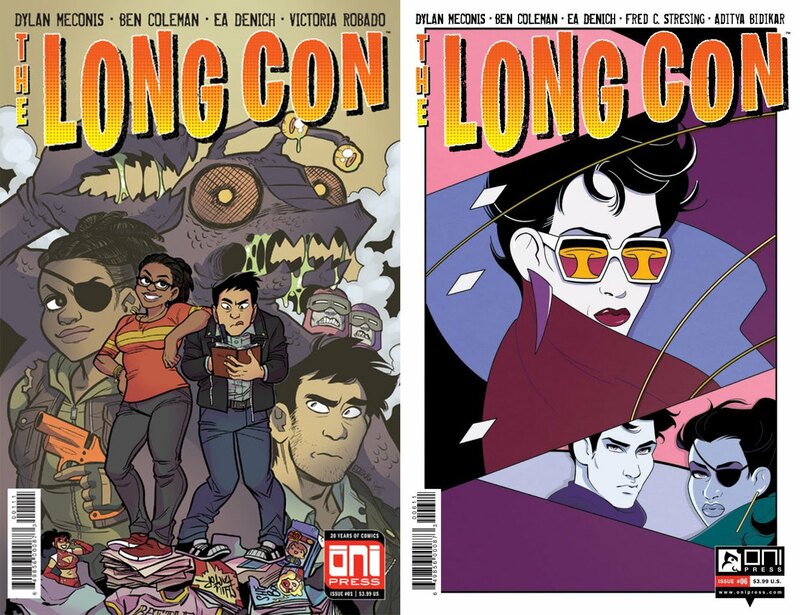 The Long Con is a love letter to fan culture and the comic industry. It’s a phenomenal look at how far the petty squabbles between sci-fi nerds and comic geeks could go. And it’s just a damn good story. Also, the main character’s name is Victor so 10/10 right there. The Long Con #6 hits comic shops this week, but so does the first volume if you want to catch up with that. Click here to pre-order a copy for yourself. 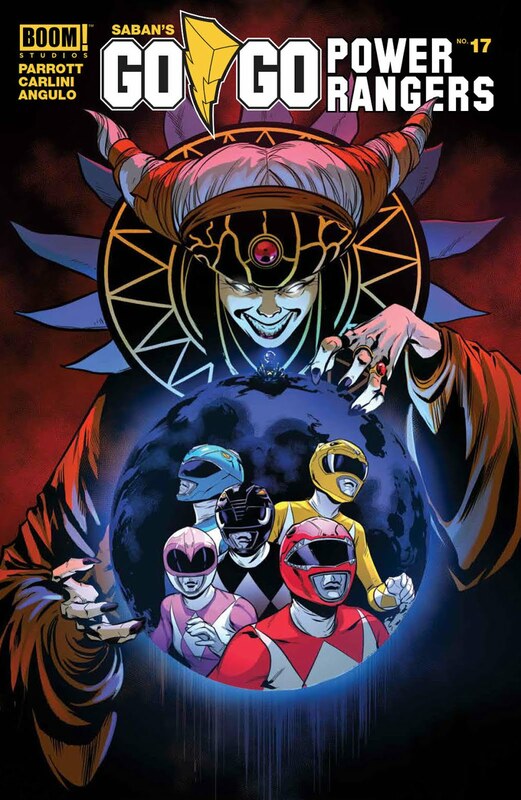 That’s right everyone, the untold origins of Rita Repulsa are finally being explored. Early preview pages have already revealed a shocking truth: Rita’s mother, Fienna, was acquainted with the one and only Zordon of Eltar. Very well acquainted it would seem. Ten thousand years later, Rita is preparing to reawaken the Dragon Power Coin. This quest takes her on a personal quest into her own past and I really want to spoil the final page of this one but hot damn I won’t. Needless to say, we haven’t heard her entire origin story yet. For the Rangers, Zack visits a guidance counselor and Jason considers ditching a karate expo so he can kiss Trini instead. Okay actually he’s having doubts about his own skills but lemme have my ship. Kim also meets her dad for the first time after learning about her parents impending divorce. My standout characters this issue? Goldar, Finster, and Baboo. Rita takes Squat on a mission and the others act like mom is out of town and gave them permission to throw a party. They’re all adorably giddy to send a monster to destroy the Rangers and when Rita gets back she doesn’t care for a second if their attack goes well or not. Spoiler alert: it doesn’t. I loved Dan Mora’s art, but I don’t really miss him with Eleonora Carlini’s beautiful take here. The Rangers really look like kids and as the arc continues to head toward some serious Rita development it’s nice to see her looking like a real person. Go Go has always been the more character driven of the two Rangers series and after over a year of getting close to each of original Rangers, it’s refreshing to see a humanistic take on the series’s villain. Everyone is excited for the inevitable Green Ranger appearance, but I for one anticipate every page just to see more of what Rita is going to do next.